is a multidisciplinary artist and media designer whose work explores the convergence of visual art, video, motion, music and technology in interactive digital media. A photorealist, whose work is in the collection of The National Gallery of Canada, her newest body of creative work is a series of large-scale digital prints based on video game imagery. Currently Michaele Jordana is the Creative Director of The PeakMedia Collective, and has recently completed the immersive Winter Sky "ceiling fresco" of digital video, 3D motion graphics, and glowing light projections synchronized to music, that transform the 24,000 sq. ft. vaulted canopy of Sherway Gardens into a spectacle of wondrous winter skies. For the past decade Michaele Jordana has lent her aesthetic vision to PeakMedia as the acting creative director. Digital art and cyber realism proved a fascinating evolution from her background as a super realist painter, where she made a name for herself stylizing and perfecting photo realistic images to add to their depth and impact. Most recently, Jordana led PeakMedia's creative team into the newest frontier of super realist art: the plasma screen and ambient painting. And true to her mantra "go big or go home" - with a tower of 96 synchronized screens, their latest work does not disappoint. 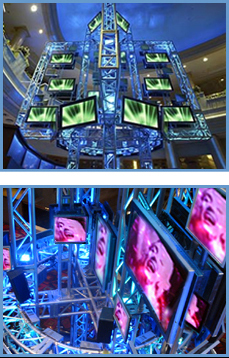 The 3-story video installation is featured on the Media Tree - designed by Reich+Petch Architects at the heart of Canada's Casino Niagara and combines adrenaline pumping energy and Peakmedia's signature high-end aesthetic. 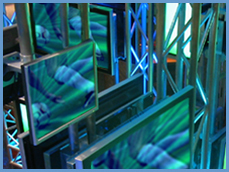 The plasma screens for the video installation that Jordana and her team designed and programmed explore light, colour, motion and texture intrerwoven with televisual images of extreme sports, classic moments in entertainment and visual ambience set to rock n'roll rhythm. The 96 synchronized screens run 24/7 and are a visual synthesis of exciting thematic moments set into a rich visual ambient field of moving coloured multi layered pictorial energy. Michaele Jordana's glowing portrait painting combine super-realism with cutting edge science fiction, capturing some of the most riveting icons her world. In a visual style inspired by William Gibson's Neuromancer, Michaele Jordana brings a life to the canvas that suggests a knowledge of humanity that delves into the unconscious. Her portraits suggests another realm, parallel with ours, but with the same intensity of life force that she brought to her whale paintings and to the stage in the explosive years of punk rock. 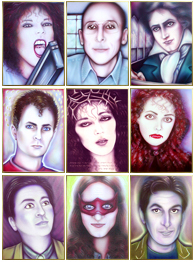 Shared among all of her portrait subjects - who range from Beethoven to Devo to the alter ego of her daughter Ramona - is the naked truth and sensitivity in their eyes. This is where Michaele's mastery of super-realism is at it's finest; She captures honesty in a subject; and hers are eyes that see into vast souls with fascinating, heartbreaking and riveting tales to tell. In a continuation of her series of portrait paintings, Michaele Jordana Berman moved into photographic, digital media to capture her subjects. 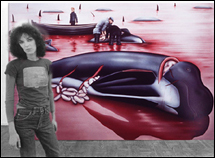 Her photodigital works use the same larger than life format she preferred when painting the slaughtered whales; perhaps pain and suffering of such magnitude demands the large omni-present scale of the work. In her travels around the globe, from the Northern corner of the Arctic, to the hotbed Middle East, Michaele has seen life in all its guises. Her newest portraits are at once modern and bibilcal, using the latest technology to delve into the souls of subjects who seem to tell the same stories as those who first wandered the earth; stories of survival, desperation & longing. Jordana finds beauty in the unlikeliest of places, yet what she captures is undeniable. Her command for the tools reveals itself through her subject's eyes, which tell stories far beyond the split second of the shutter, far beyond the 20th century, and deep into our common ancestral pulse. Michaele Jordana Berman first gained attention as a pop icon in 1976 with her solo exhibition of large super-realist paintings at Toronto's Isaacs Gallery. Her setting: the Arctic, her subject: the whales, the slaughter of the innocent. Michaele's painterly approach and strong content quickly landed her paintings in the permanent collections of The National Gallery of Canada, Art Bank, and corporate collections such as the First City Trust, and international private colletions. "Her enormous paintings...are remarkable..they have an eloquence and a sense of pity.....In their death, Berman's whales become sybols of vulnerability ...For the first time both men and whales face the possibility of extintion... If we can't save the whales we can't save ourselves. The way Michaele Berman's paintings capture this dread is what makes her work memorable". The Toronto Star's, Gary Michael Dault said of her paintings..."a rapsodic saga of pain, and beauty". In a preview of her exhibition which came out the morning it opened, he quoted her "special pleading" ..."I have suffered over these paintings", I am a tragic heroine" she said...That night, the show was packed to the street. On seeing Michaele's series of whale paintings, Ruth Rattner wrote in The Ontario Review, "Conceptions of hunter versus hunted vanished in a new vision of common mortality. It became Michaele's mission as an artist to communicate this vision. It was as if by creating these scenes she assumed the pain of the wounded animals, while bearing the guilt of the executioners, her fellow humans." 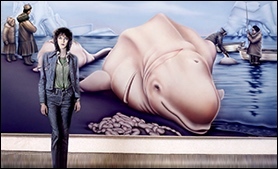 The success of Michaele's paintings of whales opened the way for her to explore other art forms, including photography. The primal images she took in the Arctic were featured at The Isaacs Gallery, in her exhibition "Carnivore". 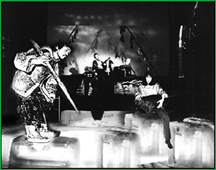 She went on to write the "Manifesto of Performance Art" with artist Wendy Knox Leet, while producing attention-getting multimedia performance works with composer Douglas Pringle, a founding member of the electronica band Syrinx. 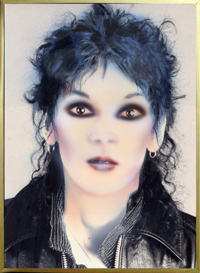 Michaele Berman, the groundbreaking young artist from Winnpeg, was about to come out of her cocoon, out from behind the canvas, and transform into Michaele Jordana the performance artist and singer, creating a persona and alter ego who proved she could make even Joey Ramone tremble. By 1978 her collaborations with Pringle in performance art had pushed the boundaries of pop culture. 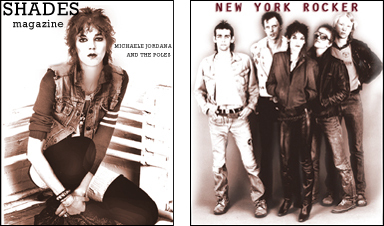 And Michaele Jordana took the music world by storm as singer of the original New Wave punk band The Poles*. Their ground breaking band was hailed in The New York Rocker as "the best recorded rock out of Toronto." 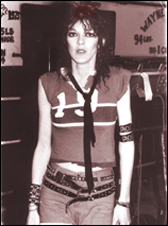 "CN Tower", Michaele Jordana's acclaimed single produced by Jimmy Frank at Nimbus9 Studios in Canada, led the band to perform in venues including Crash & Burn in Toronto, and CBGB's and Max's in N.Y. with acts like Devo, the Ramones & Patti Smith. In Paris, "Liberation" called their music "urgent rock and roll, hypnotic like Kraftwerk" and in New York City, John Cale produced and recoded their music. Hailed as the "It Girl" by Peter Goddard in the Toronto Star, Michaele Jordana won the first CASBY award & a JUNO nomination for her album "Romance at the Roxy", produced at Nimbus 9 Studio in Toronto. Variety Magazine called her "a choice lead singer, placing the Poles above other New Wave punk outfits." The Montreal Star proclaimed Michaele Jordana "a chanteuse of star magnitude." Shades Magazine called her guerrilla-girl image "little girl tough, riveting all eyes on stage." Today Magazine dubbed Michaele Jordana "a New Wave Edith Piaf", & The Ottawa Citizen wrote: "She radiates excitement like a high tension wire!" Michaele's sound, blending cyberpunk science fiction lyrics with hard driving guitars & synthesizers continues in her more recent work with Pringle. "Storming Heaven", a multimedia stage performance commissioned by The Power Plant Art Gallery in Toronto, & performed at theatres in Canada & USA, explores man's desire to conquer a world that does not belong to him alone. In the show, we storm the gates of heaven to bring back what we've lost. 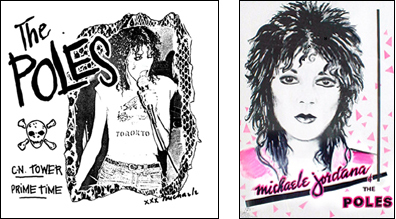 Michaele Jordana pioneered the New Wave punk sound, attitude and style and was the true forerunner of future generations of female artists and musicians. The unique sound of her band's music makes Michaele Jordana's songs as current today as when they were first released. 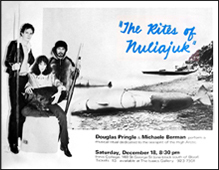 In fact, in The Toronto Star, March 30, 2003, writer/film maker David Bedini hails "CN Tower" by Michaele Jordana & The Poles as one of the top 50 all time classic songs coming out of Toronto. Jordana next produced a series of moving television documentaries. 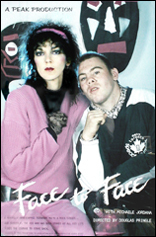 In "Face to Face", Michaele forms a video crew with disabled teenagers who are on the threshold of integration, who rise above obstacles as they meet and interview the public. 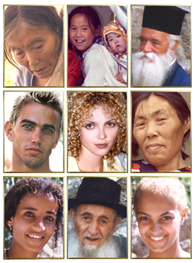 "Face to Face" won a silver medal at The New York Film and Television Festival and has been broadcast around the globe. Michaele has worked extensively in the field of education in University and public school environments, developing innovative progams in visual arts, video and multimedia. 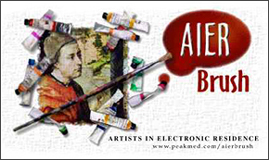 Commissioned by Industry Canada for Canada's SchoolNet, Michaele pioneered interactive online learning with "AIERbrush" - the Artists in Electronic Residence web site. Her work has been included in several publications, dailies & books including Robert Belton's "Sights of Resistance"- Approaches to Canadian Visual Culture. Michaele Jordana Berman has been the recipient of several Canada Council arts awards. She has also won several Ontario Arts Council awards. She was the recipient of the award for International Achievement from The Culture & Animals Foundation in North Carolina. Michaele sat on the advisory committee of The Bell Center of Communications - Visual/Multimedia and is a member of the Institute for International Affairs. In 2000, Michaele co-founded OneSoul Productions. She has taught classes in Game Worlds, Drawing for Animators, and The Social History of Design at UOIT and at Centennial College. Michaele has a Bachelor of Fine Arts Honors Degree. Her daughter, Ramona Pringle, is an interactive media producer, reporter and actress. .